South Korean stocks are expected to show high volatility next week as pessimism over a global slowdown will dominate investors' sentiment here, analysts said Saturday. 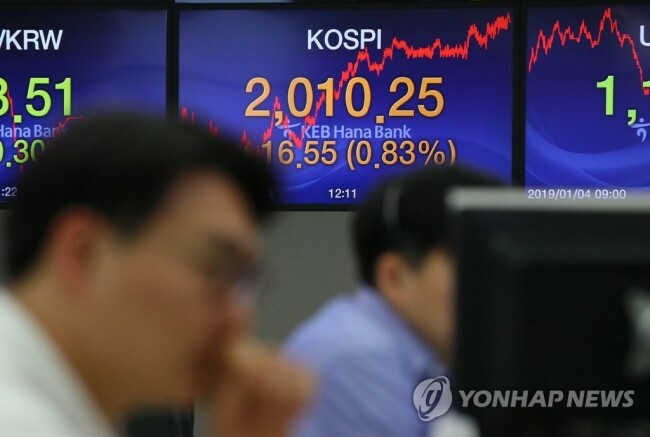 The benchmark Korea Composite Stock Price Index closed at 2,010.25 points on Friday, down 30.79 points, or 1.5 percent, from a week earlier. On Wednesday, the first day of trading of 2019, the stock market experienced a more than 30-point plunge as China-originated growth concerns swept the world. Next day, KOSPI surrendered the psychologically important 2,000-point line and plunged to a two-year low of 1,993.7 as US tech giant Apple Inc.'s earnings downgrade dragged down South Korean chipmakers and parts suppliers. Despite Wall Street struggling in the midst of ballooning fears, the index did manage to recover some 0.8 percent to make a rebound to wrap up the week. Analysts expected that the slowdown concerns will continue to affect the market throughout the coming week, making the index fluctuate more widely. "They are worried about uncertainties over the future of the global economy and the ongoing Washington-Beijing trade negotiations," said Lee Young-gon from Hana Financial Investment Co. "KOSPI will likely be swayed by external issues next week and become more volatile." Next week, the minutes of the US Federal Reserve's December rate-hike meeting will be released on Thursday. "Investors focus on whether the Fed will demonstrate its flexibility in managing the monetary normalization plan," Park Hee-chan from Mirae Asset Daewoo Co. said. "The market expects a rate cut this year."